Very straightforward as title of the post suggests. Free points are always good. You cannot earn these if you’ve seen a video like this before. Link to watch the video here. Fine Print: Offer is valid for a one-time bonus of 300 La Quinta Returns Points upon meeting the following qualifications: view the Travel Advisor video, and enter your valid member number & last name on the points deposit page, during the promotion period of September 19, 2013 through November 15, 2013. 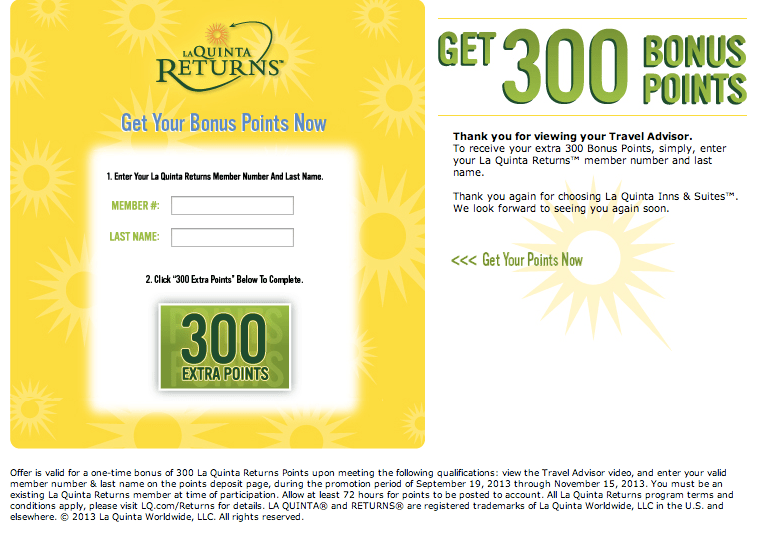 You must be an existing La Quinta Returns member at time of participation. Allow at least 72 hours for points to be posted to account. What can you use these points for? You can transfer them to points.com, or save them if you can earn more. FYI, here is the updated link for a new 300 points.